I might be the only person I know to have read American Gods and not adored it with my whole heart. This was my second foray into the much-touted Gaiman territory (the first being Good Omens, which Gaiman co-authored with fantasy author Terry Pratchett, and which I did adore), and while I did like the book, I certainly did not love the book. But I'm getting ahead of myself. American Gods, which won both a Hugo and Nebula award, is most often categorized as a fantasy novel, though it in fact draws more heavily on mythology, religion, and history than on the classic tropes of the fantasy genre (magic, spells, dragons, the like) in its execution. Which is not to say that it is not a fantasy novel, for it is, but that it is not what one might initially expect. From what little I've read of Gaiman, I'm thinking he has a bit of a thing for religious history. And really, I can't say I blame him -- the stuff fascinates me. The variations on central themes, the myriad attempts to explain our existence, our place in the world, our importance: this is interesting stuff, and Gaiman uses it well. American Gods centers on the idea that the gods we believe in, or anyone has ever believed in, walk among us. But as religion falls by the wayside and Americans begin to worship money, television, power, and the like, the old gods find themselves threatened, falling by the wayside, no longer thriving as they once had. This contest between old and new sparks a war in which -- you guessed it -- the old gods of war, of love, of luck, of Spring, of moons, of stars, of night, of day battle the new gods of shiny objects and fads and trends and money and power. Caught up in the middle of all of this is Shadow, our seemingly normal protagonist, who finds, upon completing his three-year prison sentence, that his wife is not only dead, but had been cheating on him. With his best friend. Shadow, then, is out of jail, out of luck, out one wife, and out of a job. He is out of reasons to live. So perhaps it makes sense that he falls in with the gods that come to him, accepting in stride the oddity of the requests, the strangeness of swearing fealty over three glasses of mead, the bizarre night in which he pulls a coin from the air, the inevitability of battle. But in the end, I struggled to understand Shadow, who is, in effect, the crux of the novel. 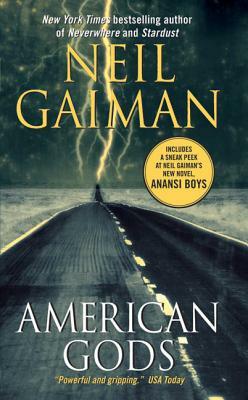 Though Gaiman's writing is deft and skillful, and the story here is complex, engaging, and interesting, this lack of connection with our assumed protagonist proved a sticking point for me. Because in the end, if I cannot believe that Shadow would act as he does, or react as he does, can I believe anything I am reading? Despite this, however, American Gods is what one might call a thoughtful -- and thought-provoking -- novel, and in this, it redeems itself. Although Gaiman is not the first to work from an assumption that gods walk among us (who sang that obnoxious song about god riding the bus as one of us, again? ), he has done so in his own unique, convoluted, and often dark way, giving us a novel that is both powerful and understandable, if not entirely believable. This one was iffy with me, but I feel like it's one I should re-read to see if I think differently of it with time. Any mention of this book always makes me think of flying, since I read it while on a plane. Anyway. It's been several years, but I remember really liking it but not loving it as much as some of his other work. I also remember feeling really bad for Horus. I only *liked* AG rather than run-around-in-circles-LOVE-it. Like Andi, I'll probably do a reread sometime in the future, but it really was just meh. I never really cared what happened to the main guy, but loved the gods' tales. I know plenty of people who can't stand this book...it seems to inspire a love it or hate it reaction (I'm in the love it camp). Anansi Boys though...ugh. Even though it's supposed to be tied in to this one, it left me cold.